"This book will inform and inspire all those wanting to make change . . . and achieve a goal against all odds." "The networked age has revolutionized the way the public engages with institutions and organizations. 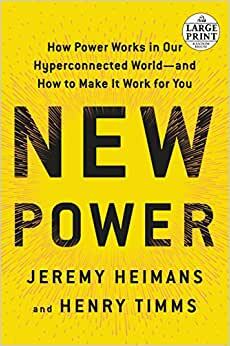 New Power is an essential and extremely insightful guide for anyone who wants to maximize the opportunities for progress and impact in today's new tightly connected world." "If you want to understand how the world is changing, what's really happening and how we can all find our way, this book could not becoming at a better time." "A must-read, New Power is a gift to our movements. It's not just about going viral--it's about connecting millions of people to roll up our sleeves and create the changes we long for." "This fascinating book will transform your understanding of how to gain power--and how to use it for good." "A vital book. New Power can light a flame bright enough to outshine the glinting fangs and tiki torches." "If you do not understand new power, you will not fare well in the new networked world of the 21st century. It's that simple." "This is the cool, clear guide we all need to navigate the Trump era." "A wonderfully incisive contribution that not only explains how the dynamics of power are changing, but also provides the tools--and the confidence--to harness those changes to build businesses, spread ideas, and make a better world." "The nature and use of power is changing rapidly, distributing broadly in unexpected channels. New Power provides the practical tools to help us all understand this shift. But it also draws out the big battle of our times--whether all this new power will end up being used for good or bad." "Power is shifting as never before, so New Power is addressing a vital issue for our times: how to make the voices and choices of all, not just a few, count for something. Plaudits to Heimans and Timms for their determination to help shape the future, not just complain about it." "New Power is a tour de force by two of the great mobilizers of the first global generation." "New Power is both a practical guide and a much needed dose of optimism, helping us understand that the future is ours for the making. A must-read for today's leaders in any field." JEREMY HEIMANS is a lifelong activist and the co-founder and CEO of Purpose, an organization that builds and supports social movements around the world. HENRY TIMMS is president and CEO of the 92nd Street Y, a visiting fellow at Stanford, and co-founder of #GivingTuesday, an international day of philanthropy. This book is a MUST READ in the truest form of the phrase - brilliant, thought-provoking, useful, and able to be applied to work, movements, business, as well as everyday life. Also one of the only books . It provides such tangible case studies and applications of the ideas being discussed that really make it real and digestible. It explains the things happening in the world around us - shifts in business models, movements, activism, - but it explains it with real world case studies, like the ice bucket challenge, Airbnb, #GivingTuesday, and not just in theory. Could not recommend this book more highly, I couldn't read it fast enough. I hope they put this book in the curriculum at colleges! I really wanted to like the book. The concept is interesting and explains very well the structure of many new organizations and movements. My problem lies in the writers. Maybe not both, but at least one of them leaves his political bias so exposed, it feels like I'm reading a manifesto at some points. I get it, movements that you support also use New Power structures and you like that. I'd be fine with reading a positive position of those movements if you didn't also have a blatant negative bias against anything that even slightly goes against what you support. There are times when showing a negative bias is good, like when describing organizations like ISIS. But when you make your reader feel insulted for believing in different politics than you, you've written your book wrong. New Power lays it all out for you. It is the primer you need to understand how to navigate changing the world we see around us. The way movements are built has changed and this book does a great job of explaining how. 5.0 out of 5 starsConceptual and Actionable rolled into one. New Power does a phenomenal job at taking what could be an esoteric concept (the new participatory culture we live in) and making it practical for leaders. The authors both have immense success in building next generation communities and that experience shows. They provides actual frameworks and methods for leveraging New Power. The book is well-written and fun to read. Would recommend for both entrepreneurs and established executives. This one's a page-turner – books that try to explain broader dynamics like this one often get stuck in abstractions, but the authors' case studies are fascinating and really bring the concept to life. A quick read. Can definitely see this being applicable in lots of different ways. No question that new power is a growing presence in the era of Trumps and Brexits and Marching For Our Lives – extremely useful framework to help explain how we've gotten here. Highly recommend!